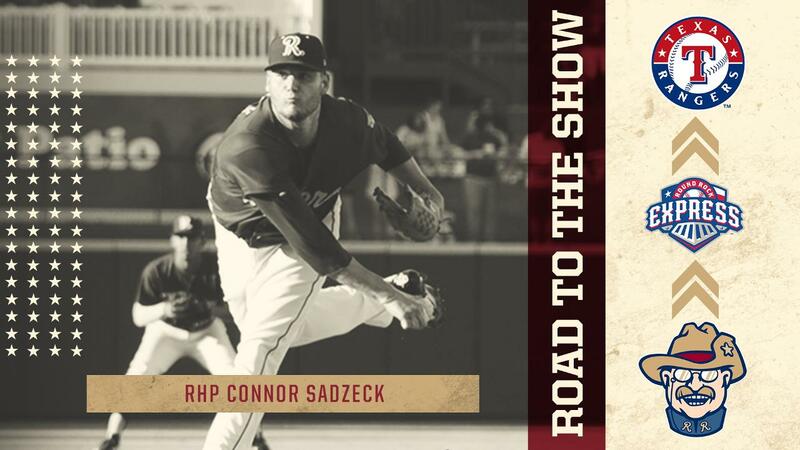 FRISCO, Texas (Sept. 1, 2018) - Former Frisco RoughRiders pitcher Connor Sadzeck made his Major League debut with the Texas Rangers Saturday night, becoming the 146th former Riders player to debut in the big leagues. Sadzeck faced one batter, striking out Minnesota's Mitch Garver , in Saturday's game against the Twins. He had been recalled from Triple-A Round Rock on Friday. The righty pitched for the Riders, the Double-A affiliate of the Rangers, from 2015-2017 and went 15-17 with a 5.35 ERA during his tenure in Frisco. He ranks fourth in franchise history in innings pitched (254), tied for sixth in wins (15) and third in strikeouts (260). He is the sixth former Riders player to make his Major League debut this season and all six - Ronald Guzman, Ariel Jurado, Isiah Kiner-Falefa, Jose Trevino, Jeffrey Springs and Sadzeck - have debuted with the Rangers. The Frisco RoughRiders are the Double-A affiliate of the Texas Rangers and play their games at beautiful Dr Pepper Ballpark in Frisco, Texas. The team was founded in 2003 and has finished first among all Double-A franchises in attendance in each of the last 13 seasons (2005-2017). In August 2014, the RoughRiders were purchased by an ownership group led by Chuck Greenberg. Since then, the new ownership group, together with the City of Frisco, has spearheaded numerous major franchise enhancements, investing over $8 million in a wide array of facility upgrades and improvements, including a state-of-the-art HD video board, sound system, Bull Moose Saloon, InTouch Grille, Riders Outpost Team Store and the world's largest water feature in a sports facility, the massive Choctaw Lazy River. These enhancements earned the Riders and the City of Frisco Ballpark Digest's prestigious "Best Ballpark Renovation" award for two consecutive years (2015 and 2016). More than 140 former RoughRiders players have gone on to play Major League Baseball, including All-Stars Chris Davis, Adrian Gonzalez, Ian Kinsler and Neftali Feliz, as well as current Rangers stars Elvis Andrus, Rougned Odor and Nomar Mazara. For more information on the Frisco RoughRiders and Dr Pepper Ballpark, please visit RidersBaseball.com or contact Ryan Rouillard at RRouillard@RidersBaseball.com.